Thank you so much for all of your love and support. Hands down I have the greatest clients in the world. I am so grateful for every time you send me a selfie, book your next appointment, and refer and friend. It truly means a lot to me that you are supporting my dream and my business. So let me tell you why I'm making this post... awhile back I tried a new product and I want to make sure all my lovely clients know about it. It's the Creme of Nature Apple Cider Vinegar Rinse. Listen! Initially I was curious about the product but I'll be honest I didn't expect to love it. Hands down it is one of the best products I've used in a really long time. I can't say anything bad about it. 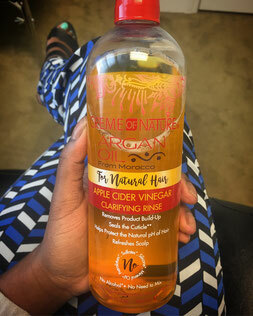 It made my hair soft, shinny, and it smells so good (nothing like ACV). So if you're still rocking your protective style and you need to wash and revive it. Please grab a bottle of this rinse. I haven't seen it at Walmart or Target yet but you can buy it online here or you can buy it at a local beauty supply store. Last thing, I want to thank you for your support and return the favor. If you or a family member have a business you would like to promote please send me a description of the business/ service with contact information, pictures, social media, or your website so I can share it with my clients. Or if it's easier please leave your business cards in the shop on your next visit.